The TestDrive has been replaced by the OpenFaaS workshop which is a set of self-paced labs developed by the community to teach you the basics of building Serverless Functions with OpenFaaS. OpenFaaS (or Functions as a Service) is a framework for building serverless functions on Docker Swarm and Kubernetes with first class metrics. Any UNIX process can be packaged as a function in FaaS enabling you to consume a range of web events without repetitive boiler-plate coding. Please support the project and put a Star on the repo. OpenFaaS is Kubernetes and Docker-native. In this test-drive we'll be using Docker Inc's online lab for Docker Swarm called play-with-docker. You'll be up and running in a few minutes and invoking functions via the UI, the CLI or via curl. 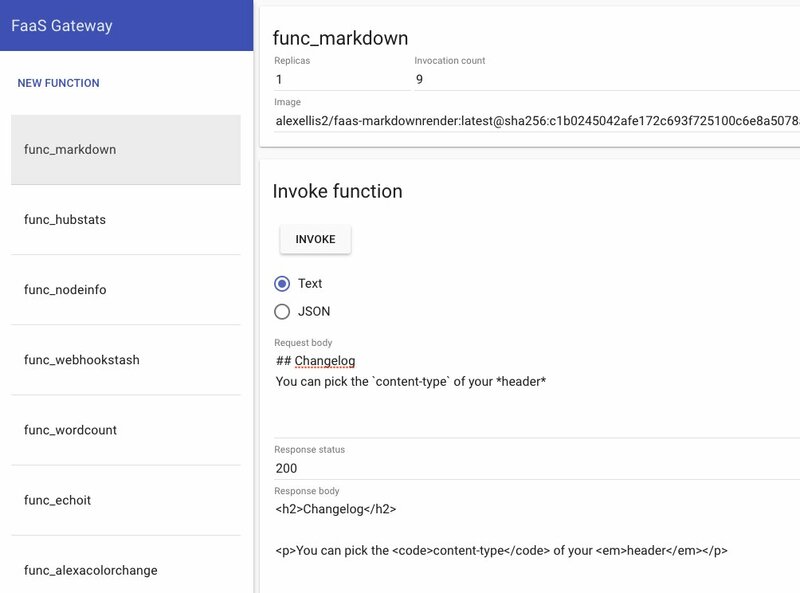 You can deploy one of the ready-made functions from the built-in Function Store and try out everything from figlet, to OCR, to colorisation with machine-learning. The guide makes use of a cloud playground service called play-with-docker.com that provides free Docker hosts that expire after around 5 hours. Once you are familiar with the workflow, you can also deploy to your own laptop or cloud host. Head over to https://play-with-docker.com/ and start a new session. You may have to have to fill out a Captcha and log in with your Docker Hub account. The shell script makes use of a v3 docker-compose.yml file - read the deploy_stack.sh file for more details. If you are not testing on play-with-docker then remove --advertise-addr eth0 from first line of the script. We passed a flag of --no-auth to disable authentication, you can leave this off to enable authentication for the OpenFaaS gateway. We will also install the OpenFaaS CLI which can be used to create, list, invoke and remove functions. You can do this on the play-with-docker (PWD) manager directly, or on your laptop. If you install this on your laptop then make sure you pass the --gateway flag with the address provided on PWD. On your own machine change | sh to | sudo sh, for MacOS you can just use brew install faas-cli. If your stack file is called stack.yml, then you can leave off the -f parameter. The flag -f or --yaml can also accept a HTTP(s) address to deploy straight from GitHub raw or similar. You can access functions via the command line using curl with a HTTP request, by using the faas-cli, with the built-in UI or even Postman. You can also pass the flag -v to see the Docker images being used. The UI portal is accessible on: http://127.0.0.1:8080/ - it show a list of functions deployed on your swarm and allows you to test them out. The following guides show how to use the CLI and code templates to build functions. PHP and other languages are available by running faas-cli template pull with various Git repos maintained by the wider OpenFaaS community. For anything else you can build your own template or use the dockerfile type to use an existing containerized microservice as your function. The FaaS CLI can be used to build functions very quickly though the use of templates. See more details on the FaaS CLI here. fProcess The process to invoke for each function call. This must be a UNIX binary and accept input via STDIN and output via STDOUT. Network The network func_functions is the default network. Once the create button is clicked, faas will provision a new Docker Swarm service. The newly created function will shortly be available in the list of functions on the left hand side of the UI. // CreateFunctionRequest create a function in the swarm. Check the Swagger API for more details of additional fields such as Labels and Constraints. # curl -X POST http://127.0.0.1:8080/function/hubstats -d "alexellis2"
The organisation or user alexellis2 has 99 repositories on the Docker hub. The -d value passes in the argument for your function. This is read via STDIN and used to query the Docker Hub to see how many images you've created/pushed. The organisation or user library has 128 repositories on the Docker hub. Grab OS, CPU and other info via a Node.js container using the os module. If you invoke this method in a while loop or with a load-generator tool then it will auto-scale to 5, 10, 15 and finally 20 replicas due to the load. You will then be able to see the various Docker containers responding with a different Hostname for each request as the work is distributed evenly. Here is a loop that can be used to invoke the function in a loop to trigger auto-scaling. Another cool sample function is the Webhook Stasher which saves the body of any data posted to the service to the container's filesystem. Each file is written with the filename of the UNIX time. # docker exec d769ca70729d find . Why not start the code on play-with-docker.com and then configure a Github repository to send webhooks to the API Gateway? Please show your support for Open Source and head over to the Github repo and Star the project.